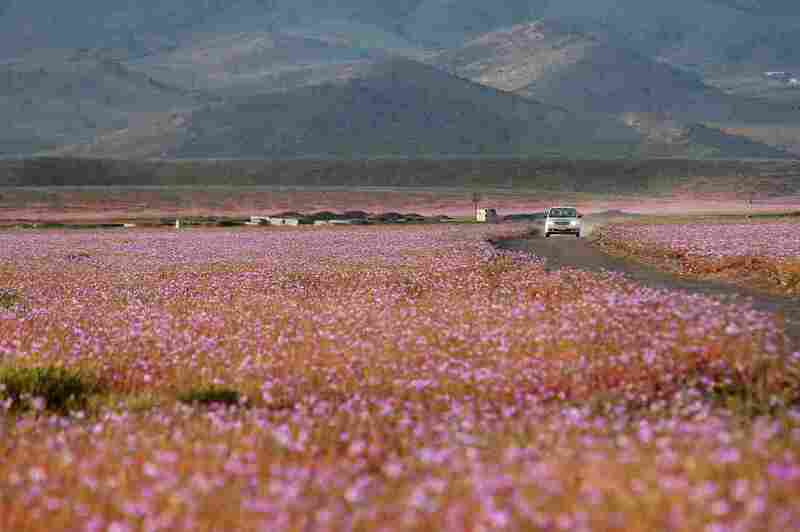 PICTURES: Atacama Desert In Chile, One Of The Driest On Earth, Awash In Flowers : The Two-Way A bloom generally occurs once every five to seven years, but heavy rains have produced a burst of color the likes of which hasn't been seen in nearly two decades. A view over a mallow field in the Atacama region in Chile on Oct. 21. This year's rainfall over the hostile land has led to the most spectacular blossoming of the past 18 years. One of the driest places on Earth has blossomed after some unusual rain earlier this year. 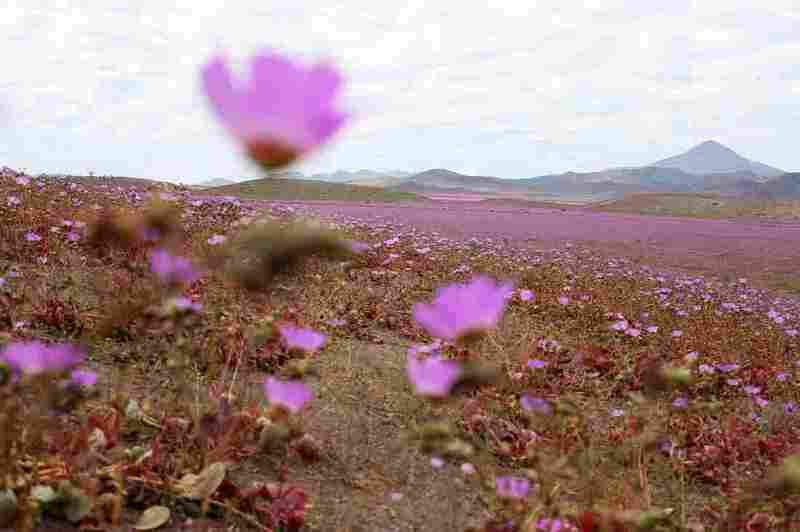 The Atacama Desert, primarily located in Chile along the Pacific Ocean, is flush with flowers after relatively heavy precipitation in March and August fell in the drought-stricken region. The bloom generally occurs once every five to seven years, but rain in March and more in August has produced an array of blooms reportedly not seen in such profusion in nearly two decades. A car passes through a mallow field in the Atacama region of Chile on Oct. 21. The rainfall on one day in March — 0.96 inches — was the equivalent of approximately 14 years of precipitation, according to The Washington Post.
" 'The Atacama region was punished, but also blessed by the phenomenon of a flourishing desert, something that happens only after the rains, this time brought about by El Niño and climate change,' he said.
" 'The intensity of blooms this year has no precedent, and the fact that it has happened twice in a same year has never been recorded in the country's history. We are surprised.' "
The desert once went more than 14 years without rain in the early 20th century, according to Arizona State University's School of Geographical Sciences. If you'd like to see the carpet of more than 200 native plant species in person, you'll have to get to Chile quickly, as the bloom will soon end, says EFE. Check out some more photos of the desert bloom from Gloria Apara Paillas, a Chilean travel blogger, on her site and Instagram feed.